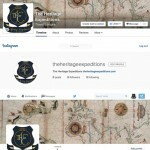 We are pleased to announce that The Heritage Expedition social media channels are now fully operational. You can follow us in Facebook, Twitter and Instagram to be instantly updated about all news and progress of our expeditions and activities. Please feel free to share these links with your friends and contacts and helps us let the world know about our exciting expedition cruises! The Heritage Expeditions LLC is a Florida based company promoting and operating genuine expedition cruises focused on Underwater Cultural Heritage (UCH) along the "Carrera de las Indias" trade route in the Caribbean and the Gulf of Mexico. © 2016 The Heritage Expeditions LLC. All rights reserved.